"All Decked Out": Now, you've got someplace to go...YOUR house! One of the most attractive upgrades to your house is to renovate the deck. Some new decks last literally years longer than other new decks. Why? 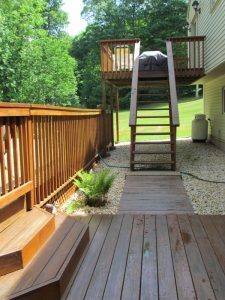 We’ll explain what your choices are in “Deck Check”, this week’s blog from HRD, Handyworks Remodeling and Design in Wallingford, CT.
WHY RE-DO A DECK, ANYWAY?  SHAPE: To add another visual dimension to your new deck, consider adding a pergola (a roofed, small part of your deck), which instantly becomes a nice place to sit, relax, or entertain.  SPECIAL, additional kitchen on the deck, including a grill PLUS a fridge, sink, and even an oven in a covered area of your new deck. 1. 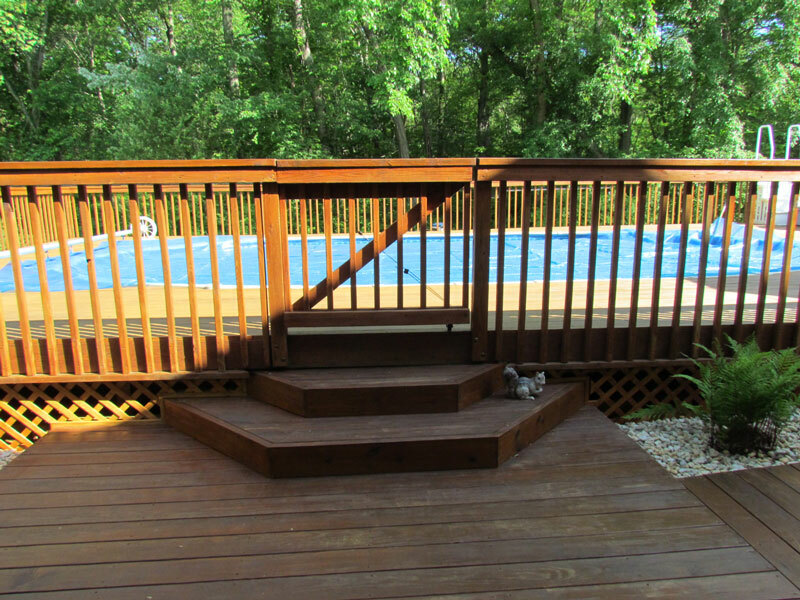 Wood Deck: nearly all decks are supported by plenty of wood, but it’s the wood that people SEE that gives a wooden deck its’ beautiful appearance. Decks are usually stained a light or dark color not only to preserve the wood, but to display a specific wood grain such as mahogany, oak, pine, etc. 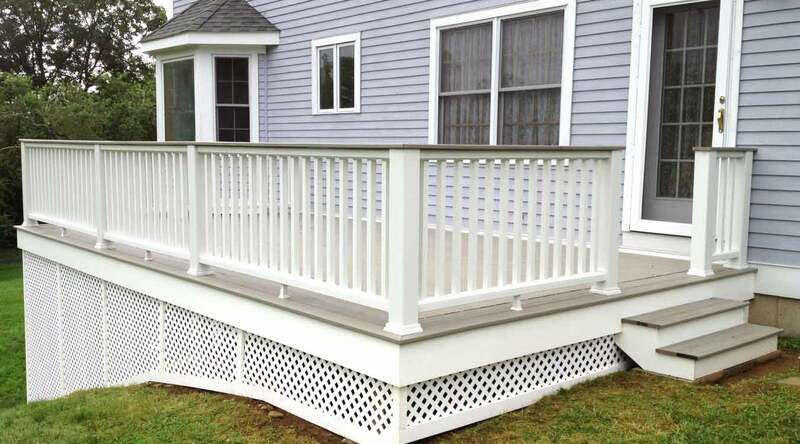 Remember—if your wood deck is in Connecticut, you must give it more attention due to the many weather changes each year. For example, I know of folks who live in towns like Wallingford, Cheshire, Guilford, North Branford, Cromwell, and Middletown, who find they must re-stain every 5 years or so. Positives: wood has a tremendous cost-savings compared to composite materials. Pitfalls: wood needs upkeep (re-stain/repair) every few years. 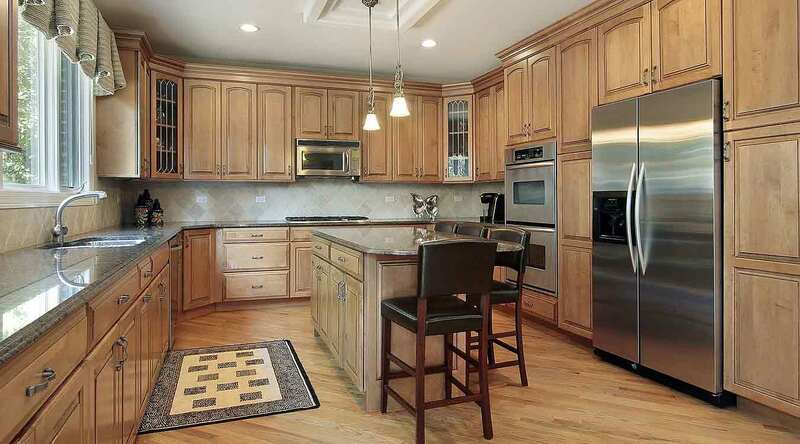 Price: 16-ft. (2x6”) wood beams cost, on average, about $20 each. 2. 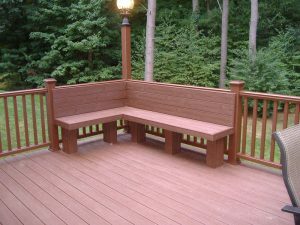 Composite Material Deck: A “composite” is a mix of materials, creating a “wood-like” appearance for the deck parts people see. 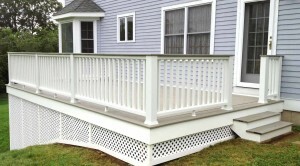 Both decks and railings can be made of composite materials. Composite material decks come in a variety of colors, just as if they were elegant, stained wood. Composites look just like wood and NEVER need staining/retreating, but cost about double a traditional wood deck. Positives: composite materials are maintenance-free. Do one and done! 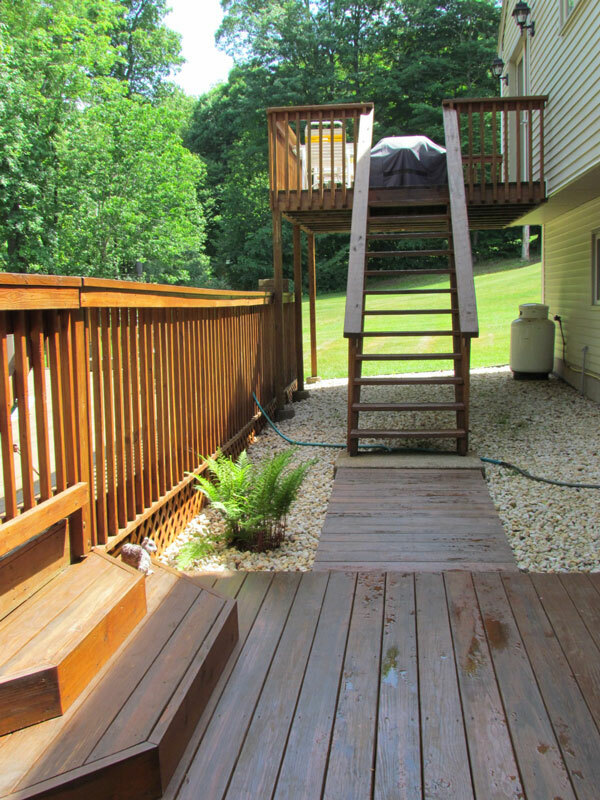 Pitfalls: composite materials cost about double the cost of an all-wood deck. Price: 16-ft. (2x6’) composite decking cost, on average, about $40 each. 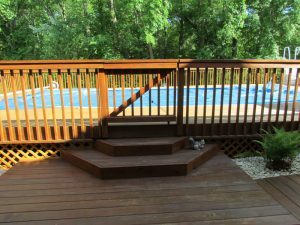 So, when it comes to decks, the price range is VERY wide, from modest to elaborate, depending on how far you want to go in each of the above areas. You've got a wide range of choices in deck materials AND deck prices. Want to see more? Stroll through our DECK PHOTO GALLERY: click here...and enjoy! Blog topic: TRUST. Click to read "References & Reputation - check BOTH before you hire"
Blog topic: PRE-THINKING. Click to read "REMODELING? Talk to Yourself, first"
Got ANY question about remodeling? Just click here. Chat with Keith Santora directly. 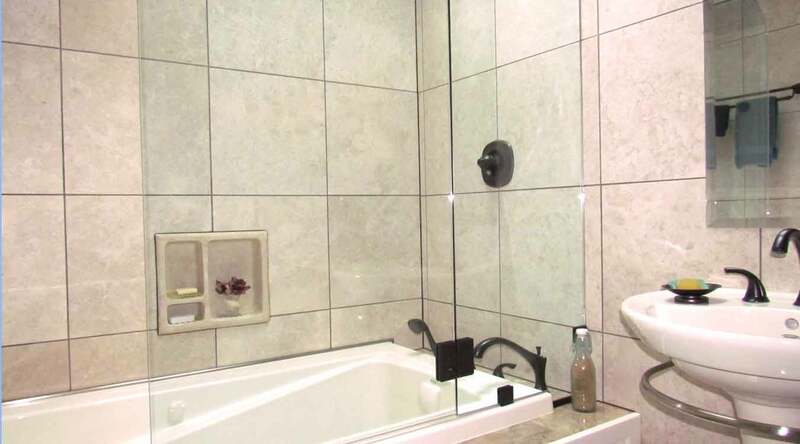 He's the head of our company, Handyworks Remodeling and Design (HRD), and has over 30 years of remodeling experience. Get a fast answer for free, no obligation, direct from Keith, often the very same day (or the next business day). Try it!